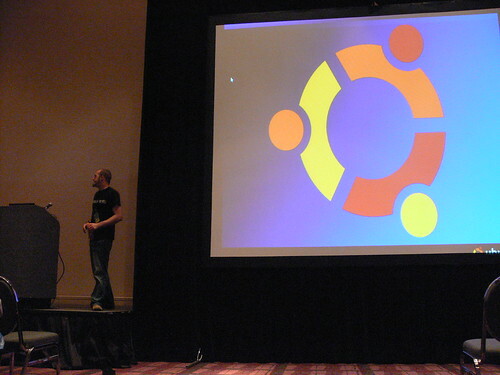 In my talk I asked how many people use Ubuntu. This was the result. Wow. A few days ago I headed to Columbus, Ohio to take part in Ohio Linuxfest. I was there to provide the closing keynote – a new presentation that I have been thinking a lot about recently called Building Belonging. OLF is an excellent, excellent event. A great range of speakers, exhibitors and an excellent attendance (1000+) provided a very loose, fun, but informative atmosphere. The organisers knew what they were doing, were running on fumes for much of the time, and were 100% committed to making OLF kick arse. And you know what, it really did. They have pulled off a stunning event there, and attending shows like OLF gets me really buzzed up. I arrived on Thursday evening, Jorge picked me up from the airport and we headed out with some of the organisers. Jorge and I then spent Friday working, and Friday night we hit the pre-party. I woke up a little tender on Saturday after an evening of Jaegerbombs with the OLF organisers, The Linux Link Tech Show guys, some Ubuntu folks and some other people. I ran through my slides one more time and then headed to the show. Did a videocast interview, interview with The Linux Link Tech Show, lunch with Debra from Prentice Hall and then back for a book signing alongside Mad Dog. I always find signing books a little weird – not sure why, it just feels weird – people like Stephen King should be signing books, not me. Throughout the day I had some really interesting conversations. The Ohio Ubuntu LoCo team did an excellent job, the Ubuntu BOF went really well, I caught up with Zonker from OpenSuSE and Paul from Fedora, chatted with Mad Dog for a while, met the Dual Core guys and talked Severed Fifth, talked to some guys about community growth in less-tech-orientated areas, and many more. A little later it was keynote time. The room was huge. Really. Damn. Huge. 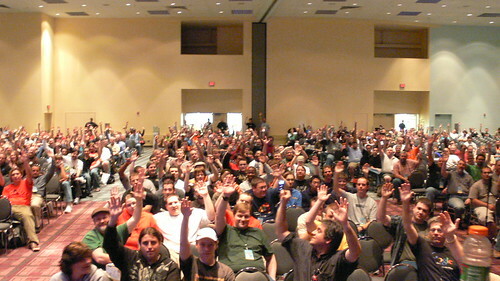 There was a great turn-out, the audience were fun, and they seemed really receptive to my message. The core of my presentation was exploring the concept of belonging – how we can build communities that are truly participatory with a real feeling of engagement and association. I explored the different elements involved in building belonging – associational life, a gift economy which builds social capital, and exploring how to build a sense of belonging, beginning with teams. As an added bonus (! ), on the Friday night when hanging out with the Linux Link Tech Show guys, Dan decided to moon me, so I took a snap of the horror show with my camera. I was all set to get the photo off my phone and include it in the talk, but Bluetooth decided to throw a hissy-fit. So, in the presentation I got Dan up on the podium to re-create that magical moment, and the audience lapped it up. Fortunately for us all, the magic was captured and uploaded to YouTube. If I remember right, it took two or three to get everyone, can those me posted somewhere? btw, was great to meet you Jono! Did you get my mail about the howsoftwareisbuilt thing? Cool! Dude you are everywhere! has the full talk been videoed?